The latest trend for transporting additional luggage with your car is a towbar cargo box. The box is available in volumes of 220 to 420 litres. A perfect way to simply quickly and easily increase the luggage space of your car. Anyone can load and remove a towbar cargo box on the towbar of a car. They have been equipped with a quick link that can manually and without tools mount the box on your towbar in five seconds. The system works on every car with a towbar. The towbar cargo box is in one piece. You will not first have to attach a luggage rack and then mount a separate box. Thanks to this, the lighting functions are part of the towbar cargo box. You will only have to put the plug of the towbar cargo box into the socket of the car before you can hit the road. Please pay close attention to the number of poles in the plug of the towbar cargo box. By default, they are equipped with seven poles. However, it is not a problem if your towbar has a 13-pole socket. Whether you have purchased a towbar cargo box from Towbox, Urbeni, MFT, Menabo boxxy or Thule, most suppliers provide a plug adapter with their product. Of course, you may want to open your boot during your journey. This is not a problem with a towbar cargo box. In almost all cases, the box can be tilted forward after it has been attached to your towbar, ensuring you can always reach the boot. When mounting and removing the towbar cargo box, you will not have to lift a heavy load for long. The towbar cargo box is equipped with fold-out wheels and is therefore easily moveable. The towbar cargo box can therefore be packed in any location before it is mounted to the towbar. You will never have to reach above your head to pack or unpack your luggage, unlike with a roof box. You can put possibly wet or dirty things in your towbar cargo box instead of your car, ensuring you can keep your car clean. Purchasing a cargo box is quite an investment. Depending on the size of the box, prices vary between 500 and 800 euros. However, considering the fuel savings against that of a roof box, you will have recouped the costs of the box after about 20,000 km. You will save at least 13% in fuel costs compared to a roof box, as a towbar cargo box is situated behind your car and more aerodynamic in design. The complete system and the cargo box can be locked separately. You will therefore not have to worry about the theft of your things or the product in itself. On the road, the plastic towbar cargo box ensures your luggage is well-protected against the weather. The cargo boxes have been put to the test in the most extreme driving circumstances. 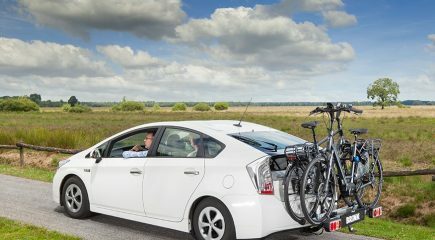 They have even undergone crash testing (should disaster strike) in order to ensure that the luggage carrier will always be mounted in such a way to be able to guarantee your safety and that of the other road users. Not every towbar cargo box is suitable for your car. This all has to do with the maximum nose weight of the towbar that has been mounted on your car. In more simple terms: you can load your towbar up to a maximum weight, as determined by the manufacturer of your car. The maximum nose weight is usually listed on the plate next to the socket of your towbar. If not, you can usually find it in your car’s papers, or request the information from a brand dealership. This maximum nose weight differs per car, but usually lies between 45 kg in small cars and 75 kg in larger car models. A nose weight that exceeds the maximum limit due to excess weight results in undue taxation of the car’s suspension and towbar mount. In addition, it negatively influences the driving capabilities and power steering. If you want to transport a cargo box on your towbar, you will have to know the total weight of your cargo box and your luggage. The weight of your cargo box can be found in the product description of the manufacturer. You will have to weigh your luggage yourself. When purchasing a cargo box, keep the maximum nose weight in mind. We recommend you select a cargo box that is as light as possible, which leaves more free weight available for your luggage.